5a. Explain the term Quality Control. Random and planned sampling of the product during the manufacturing process. Ensuring that components are positioned correctly, or that they are the correct type and size. Tolerance checks carried out to ensure that components / parts are the correct size. A combination of visual checks and automated checks (by sensors and computers) are usually carried out. A final quality check should include, testing the product to ensure it is to the correct standard, before it is distributed to the retailer / customer. 5b. With reference to the printing process you named and described in questions 3 and 4, explain how quality is controlled during the process. During the screen printing process, the quality and consistency of the ink/paint is checked on a regular basis. The alignment of the base, vinyl, template and screen is also checked, so that the final print is accurate. The screen and the template are cleaned between prints, to ensure that dried ink / paint does not spoil the quality of each print. When a print is removed from the screen printing equipment, it is checked visually for faults and if necessary recycled. 6. Explain what is meant by the term ‘smart material’. A smart material is one that reacts to a stimulus such as heat, light, humidity or moisture. When the stimulus is removed, a smart material normally returns to its original condition. A good example of a smart material is photochromic ink. This is an ink that darkens as the light level increases. As the light level decreases the ink returns to its original state. 7. Phosphorescent ink is ideal for some products. Give an example of the practical application of phosphorus ink and explain how this smart ink it works. Phosphorus ink is ideal for the letter on learner driver number plates. In normal day light, the ink absorbs the energy of the sunlight. 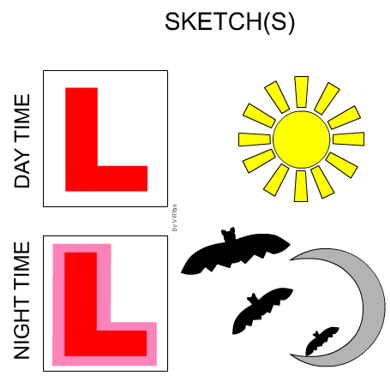 The ‘L’ plate looks the same as any other ‘L’ plate during day light hours. However, at night the energy absorbed by the ink during the day time is emitted as light, illuminating the ‘L’ on the plate. An advantage of using this smart ink is that the learner driver plate is more likely to be seen at night. A disadvantage is that the plate is much more expensive than a normal plate.